From the remote and unforgiving landscape of northern Europe, the Vikings voyaged to far-flung areas of the world with extraordinary consequences. Vikings examines the origins, explorations and settlements of these seafaring people, exploring their impact on the world as colonizers, craftsmen, traders and state-makers. 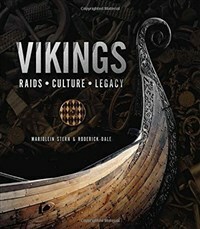 This highly illustrated book provides a revealing portrait of the Vikings' incredible legacy with a collection of photographs and rare documents. Roderick Dale is an archaeologist and expert in Scandinavian history, old Norse language and literature, Viking Age warfare and the Vikings in popular culture. Roderick has worked with a number of authors as a historical consultant, most recently on Anita Ganeri's Norse Myths and Legends (Raintree Publishing, 2012). He was an expert in the 2010 Time Team Special - The Real Vikings, providing a short interview segment with Tony Robinson on the Viking berserker. Marjolein Stern is an expert on the Viking Age and Medieval culture and communication. She has written numerous articles on aspects of Viking culture and has just completed her PhD on runestone images and visual communication in the Viking Age. She is based at the Centre for the Study of the Viking Age at Nottingham University in the UK.